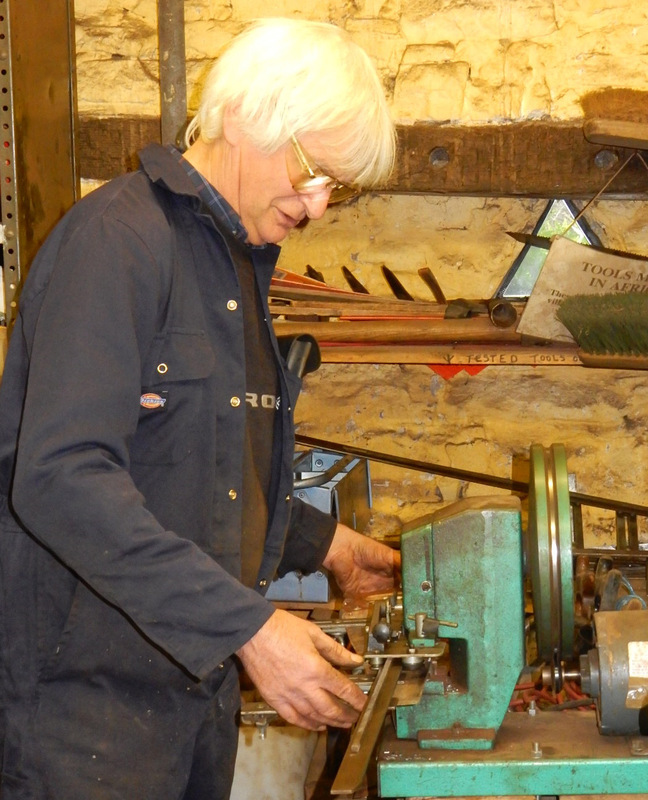 John Mponeja of Tugeme Blacksmiths with his pedal grinder, which won first prize in the Mashinji Memorial Prize in 2005 sponsored by TFSR Cymru. 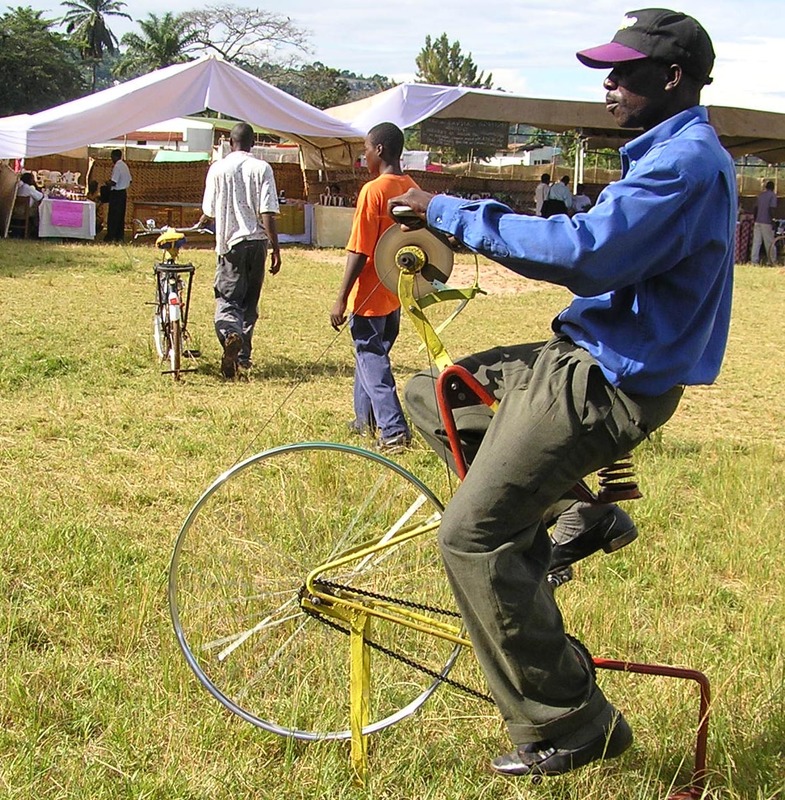 This was at the last Zonal exhibition we visited in Bukoba. Tugeme group have since gone on to make some of our Fair Trade tools which are so popular here in Wales. Sadly John died last year, but we will certainly remember him when we visit the exhibition again in December. We received a grant from the Morel Trust to help fund artisans to travel to Bukoba for this year’s Exhibition. This is like a great county show, and it helps them to sell their products and to network amongst themselves. We sponsor an annual prize for innovative black-smithing in memory of our old friend Joseph Mashinji. We will bring you more news on our return. 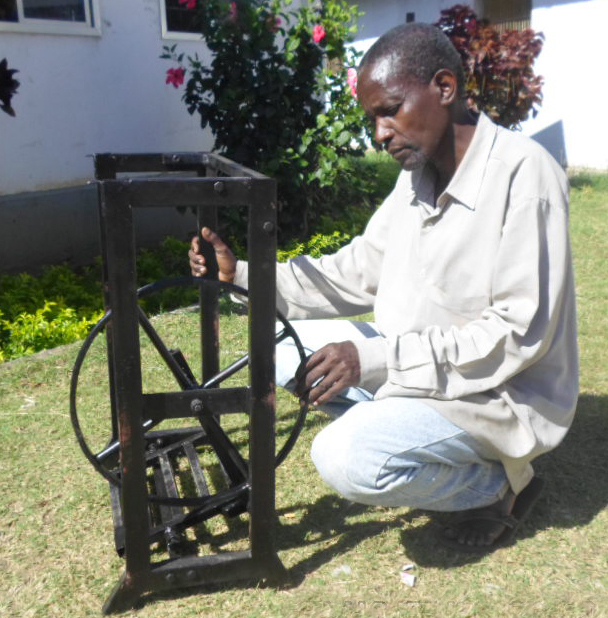 Abdullah Boma has returned home to Tanga with the treadle base he learnt to make in Mwanza. Trustee Ian Jones will be going to Cardiff next week to receive a plaque which celebrates our award from Carwyn Jones, the First Minister of Wales. This will be an evening to celebrate all the incredible partnerships that exist between Wales and Sub-Saharan Africa. Dai Chivers had a month off from volunteering with us. Now he’s back in action, and has worked his way through countless piles of handsaws on the tooth cutter. We cut new teeth on nearly all the saws that we send to the Mwanza workshop, which helps Viviana when she come to give the teeth a final set and sharpening. We have been given notice to leave our tool store by next April. 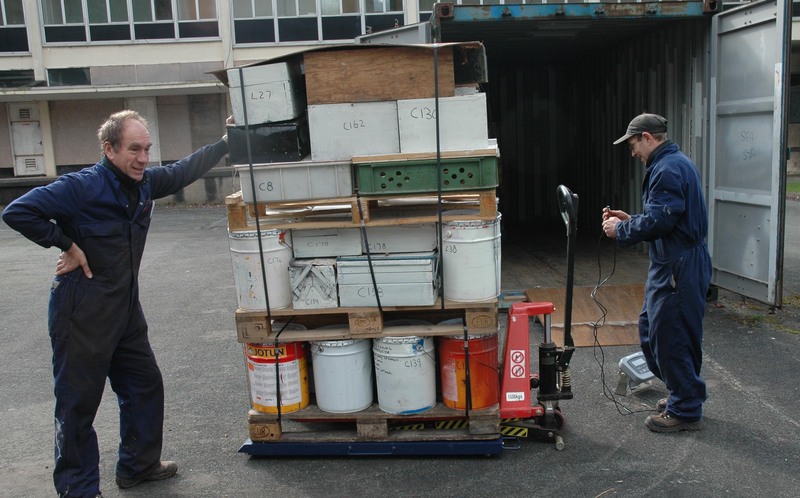 A great big thank you to Ross Murray for letting us have so much useful space for storing all our crates of tools, our sewing machines, our events gear such as marquee, and not least of all for the place to leave our containers while they were loaded. We have have had the use of all this space at Cwrt-y-Gollen Camp for at least the past 12 years. Now at last we know we have to go, and of course it makes us nervous! Where will we find a space that is as big as we are used to, and that costs us little or nothing? It needs to be be pretty local to Crickhowell, so we don’t have to spend a lot of time moving crates of tools between our workshop, the sewing machine workshop and our new store. Hopefully we will have more news on this next month ? Our website has been updated which should make it easier to navigate. Please do support us by making a donation or buying your Gifts in kind for Christmas, and a BIG thank you to all those who offer us their regular support.